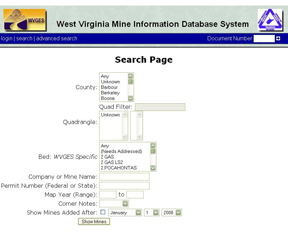 The West Virginia Mine Information Database System (MIDS) contains records of every mine map available at the West Virginia Geological and Economic Survey in Morgantown, WV. The database is comprised of over 48,000 documents and over 85,000 mines. Information concerning coal seams, mine names, company names, counties, and quadrangles are all available in MIDS. Most of the mine map records contained in MIDS are available at the West Virginia Geological and Economic Survey in the form of paper maps, aperture cards (microfilm), and digitally scanned mine map images. MIDS can be accessed and queried from any web enabled computer. Using Microsoft Internet Explorer or Mozilla Firefox, simply navigate to the internet address http://www.wvgs.wvnet.edu/www/mids/main.php. From there you are greeted with the search page where you can query the database. Need help using the using the "search" feature? Click HERE or on the help button below.